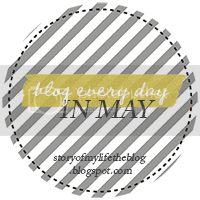 I'm linking up for the Blog Every Day In May challenge again. Today's prompt is: Five songs or pieces of music that speak to you or bring back memories. So here we go! The first one is "What A Beautiful World" by Louis Armstrong. This song brings it way back to preschool for me. It was the song we rehearsed (and rehearsed) and sang to for our preschool graduation. I have a very clear memory of my Grandparents sitting in the crowd watching me with their big smiles and looking oh so proud. I had a very strong bond with them and seeing them made me feel so good. I lost my grandmother in 2003 and my Grandfather lives far away so this song and memory holds a very special place in my heart. Gives me goosebumps and butterflies. every time. Peaches and herb "I Pledge My Love" - this was the song Phillip and I danced to for the first time as husband and wife. It's old school and I loved that. Jason Mraz and colbie caillat "Lucky" - This was mine and Phillip's song after we got married. Actually, my little brother is the first person who played it for us because "it reminded me of you two". It pretty much sums us up. We are so blessed to be married to our best friend. This was so fun and definitely brought back some special memories. I Can't wait to see what everyone else put together! What A Wonderful World is such a happy maker! What a great choice of songs! I love love love 'Put ya records on' and haven't heard it in so long! Thank you!!! I was team BSB too and that song brings back so many childhood memories! Lucky is such a romantic song - I love it! And Put Your Records on totally makes me want to stick my head out the window and belt it out! Great list!